When it was completed in 1873, the Coignet Building in Gowanus, Brooklyn, stood as an impressive ode to the future of construction. The earliest known concrete building in New York served as a showcase for the New York and Long Island Coignet Stone Company, a manufacturer of concrete cast stone. “They [represent] the start of the building industry moving from craft into something much larger,” says Mary Jablonski of Jablonski Building Conservation, who worked on the Italianate structure’s recent exterior restoration. History would have other plans for the Coignet Building; shortly after it was completed, the company folded. A faux-brick stucco facade was added over the concrete exterior, probably in the 1960s. The building was vacant for decades and continued to deteriorate until supermarket chain Whole Foods expressed interest in the adjacent empty lot in the early 2000s. 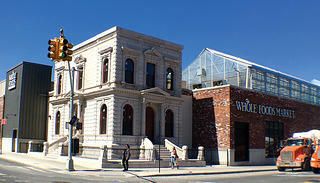 Whole Foods ultimately purchased the lot with the stipulation that it would restore the exterior of the building, which in 2006 was named a New York City landmark. With the eventual help of stonemason Ken Uracius and his team, Whole Foods finally began restoration in 2014 after a series of complications. The faux-stucco facade was removed, and Uracius repaired and rebuilt damaged portions of the historic cast stone. A white lime wash was added to the exterior, returning the building to its original color. The restoration was completed this past spring and, as of press time, the Coignet Building was for sale. 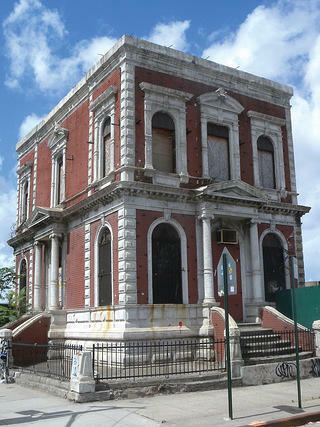 The Coignet Building before Whole Foods' restoration.